Minimising the spill factor with Contigo Kids Cups! Kids and spills go hand in hand, at least in my home anyway. The more I say “be careful”, the more spilling action there is. I love the development of the non-spill sip cup over the years, but what about when toddlers get past that stage? The Contigo Kids Cup will no doubt save my carpet, my car seats and the lining of my handbag, for which I’m grateful! These cups feature the fantastic ‘Autoseal’ technology, children will find it easy to press the button on the side of the bottle to open the seal and drink, then when they take their finger off the button it closes water tight. 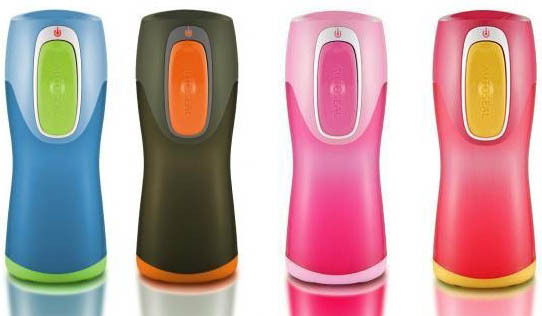 Contigo Kids Cups have a contoured body that makes holding easy for little hands and come in a variety of funky colours. Each cup is 100 per cent BPA, Phthalate and PVC free and holds 250ml of liquid. Cleaning is easy as there’s no fiddly bits, you can even toss it in your dishwasher to clean! The Contigo Kids Cup is available locally at Bonito Baby for $11.95 with delivery available all over Australia.